Sweet chipotle, bread and butter, half sour, horseradish, kosher dill, super spicy. 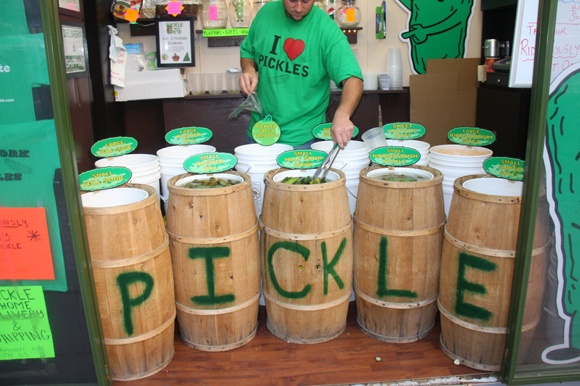 Pickle fans will love the buckets of briny green treats at Pickle Me Pete in the park. Pete has it all at his Holiday Shop. You can get a pickle to eat right away, or fill a quart with your choice of flavors. Prices start at $2 for a single large pickle, or you can get a whole quart for $7. If you want to make it a gift, Pete will dress up your pickles with decorative glass jars, baskets, or Hanukkah and Christmas themed containers. 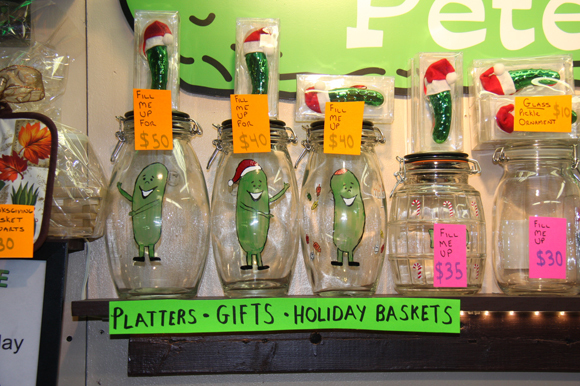 This is one stop shopping for the pickle obsessed on your list. He's also selling pickle themed tee shirts and ornaments. Packages start around $30, and he can ship gifts directly to your pickle-eating friends and loved ones. Pickle jars with Santa hats, dreidels, or candy canes.